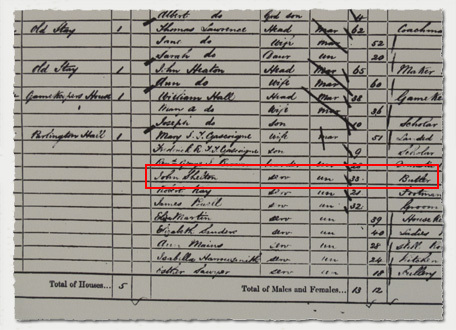 Perhaps the most striking discovery that has occurred in respect of the servants who worked at Parlington is the story of John Shelton, who was a butler at Parlington in 1861, his details can be seen on the extract of the 1861 census below. 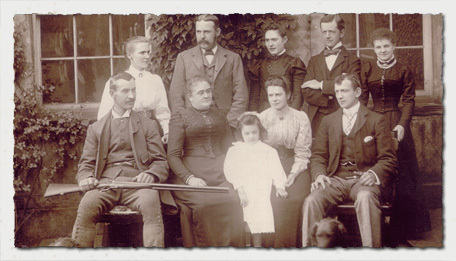 The photograph below, taken around 1908 is of the servants of the house along with the Gamekeeper, Alexander Hickmott [seated on the left] Four other characters in the picture are known; behind Hickmott is his wife Florence, and seated on the right is Louis Hawkett with his wife a daughter next to him. 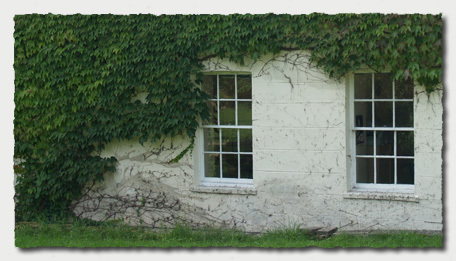 It was thought that the photograph was taken at Parlington, although no-one new where, however close observation of the window cill on the extreme right clearly identifies the location as the West Wing, the east elevation, see the close up of the the cill from 1908 and today. Since the picture above came to light, I have investigated the characters in the photograph and think they are as follows; but first, from the 1901 census, some seven or so years earlier, there are six servants recorded at Parlington, along with the old Colonel Frederick Charles Trench-Gascoigne, aged 86. Bear in mind Isabella his wife had died in 1891, ten years earlier, and her sister Elizabeth an occasional resident at Parlington had died in 1893, leaving the estate at Lotherton to the old Colonel's son, (Frederick Richard Trench-Gascoigne), by 1901 he and his wife were at Lotherton. I think Kingswell (Butler) is the man, second left on the back row of the servants, we know that the man seated on the left front row is Alexander Hickmott (Gamekeeper), with his wife behind him? Annie Harwood (Cook) is seated in the centre, then Louis Hawkett (Groom, later to become Chauffeur) is on the right, with wife seated next to him and daughter standing. Edward Griffin (Footman) is on the back row with his arms folded, at the penulimate right end, leaving the two younger ladies, May Barlow (Housemaid) and Mary Jackson (Still Room? Maid), but I don't have an idea who is who! Bear in mind that the census is probably seven years or more before the photograph, so Louis Hawkett was still single at the time of the census, whereas he has a child by the time of the picture, and I believe she was not the first born, two others I think had pre-deceased her!! 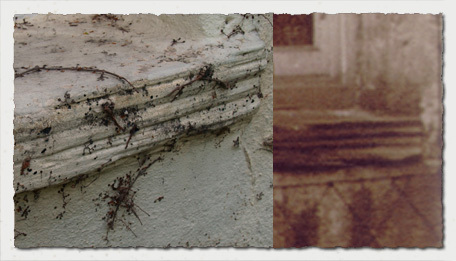 Additional information has come to light since the first posting of the picture of the servants, above. A relative of Alexander Hickmott [seated on the left] , gave me this information: Alexander Horace Hickmott is my second cousin three times removed - whatever that means! Our common link is his great grandfather Russell Hickmott who is my fourth great grandfather. The deaths of people who had first hand knowledge of Parlington in its heyday, occurred literally within my life time, but sadly I was only to discover the old place decades later! 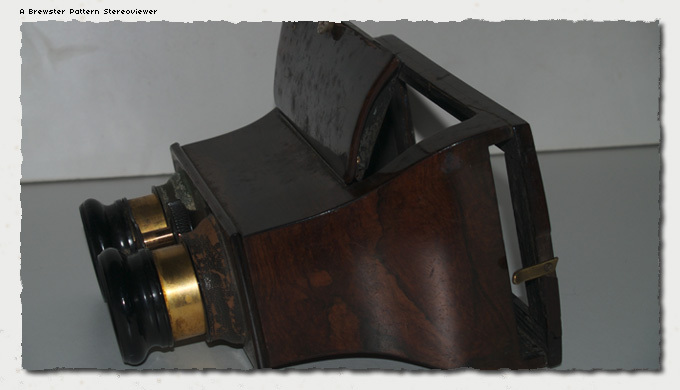 Further information on Alexander from Murray is as follows: Alexander Horace HICKMOTT was born on 17 April 1859 in Frant, Sussex. 1881 census Alexander is a servant at 'Gridge Castle', [I suspect that should be Eridge Castle, pictured here, a great collection of pictures of the place.] Frant, Sussex. 1891 census he is a groundskeeper living with brother Harry a gameskeeper at Birk Cottage, South Weald, Essex. 1901 census he is married to Florence and has a son Guy R. age 2. He is now Head Gamekeeper, Parlington Kennels, Parlington, West Riding York. Parents: Frederick HICKMOTT and Mary TURNER. Spouse: Florence DODSON. Florence DODSON and Alexander Horace HICKMOTT were married about December 1893 in Doncaster, Co. Yorkshire. Children were: Guy Reginald HICKMOTT.